In this above two lines of this scripture, we can see 3 things. First thing is when we walk, here a person is walking in the valley of death. There is one truth that no one can renounce i.e. Death. In the valley of death, we have to walk alone. No one will be with us except God. The second thing is when we walk alone still we don’t have the fear. Spirit of Death and Fear has no control over us. Third, this is the promise which Lord has given us i.e. He will be always with us. Even we are in the darkest place He will be there with us. Dear Lord give me the strength to overcome the fear and help me to trust your word, that you are with me. In Jesus name. Amen. 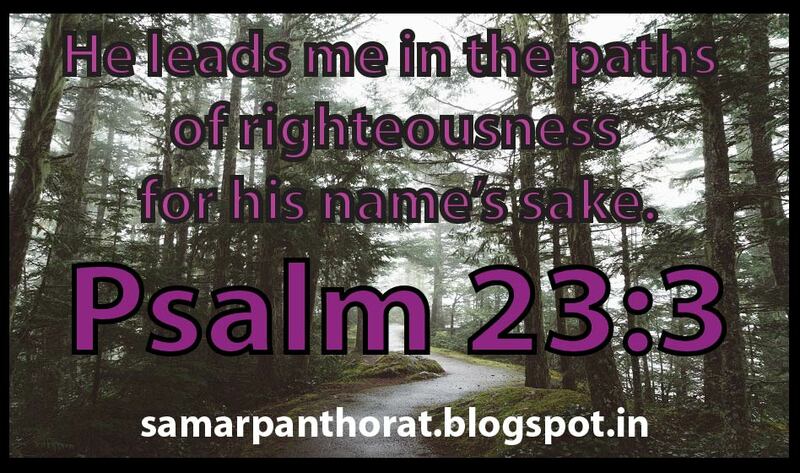 Lord Jesus our savior for his namesake leads us in the path of righteousness. There are two paths one can follow. One path leads to destruction and death, this is the path of wide gate. Other path leads to righteousness and life, this is the path of a narrow gate. While walking on the path often we get confused about which path we should follow, in this situation Bible says in John 16: 13 Spirit of Truth will guide us into all truth. Spirit of Truth is Holy Spirit ready to guide us every day into the path of righteousness. All this thing Lord do for His namesake because under His Name every one bow down. Lord help us and guide us into the path of righteousness. Give us direction to accomplish our journey and to reach our destination. In Jesus name. Amen.